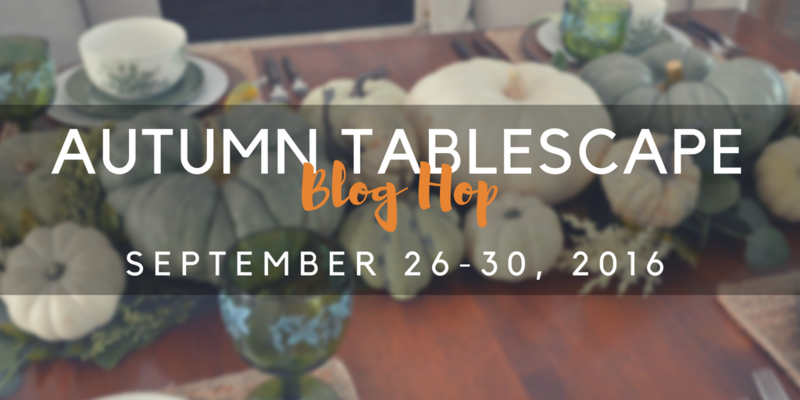 Welcome to the Autumn Tablescape Blog Hop! I am so glad you are here! I hope you have visited some of the other tablescapers and that you will visit the rest of them throughout the week. If you haven’t noticed, I love setting a beautiful table. This love came about from hosting dinner parties at home. I have always enjoyed setting the table more than the cooking. Thanks for coming to visit, I hope you enjoy all of these bloggers interpretations of an Autumn tablescape! The centerpiece is the crown on this golden tablescape. Two decorative gold antlers frame branches frame four swags from Hobby Lobby. Two of the swags are artificial magnolia blossoms that appear old and dried up and the others have leaves, pumpkins, acorns and cotton bolls. I added some additional goldenrod blossoms, and brown and gold gourds. I tried to keep the colors all shades of brown and gold for my tablescape. These beautiful salad plates were from Pottery Barn last year. I set a very different table last year using the same salad plates, when I asked, Should You Invite Birds to the Table? The gold antlers were the anchor for my centerpiece. It took me quite a bit of time to figure out how I wanted to use them and was so happy when I learned that I could get them to stand up and arch over my branches, pumpkins and gourds. I got my decorative antlers from At Home. I bought one 14.75 inch antler and one 18.25 inch antler. These antlers also come in silver if you are thinking of using them for Holiday decor. The little antler place card holders were ornaments also from At Home. Simple chocolate brown napkins were rolled and tucked into gold napkin rings and placed onto the edge of the gold starburst chargers. Chloe this is so pretty! I love the warm metallics and colors you used. Those bird salad plates are amazing! 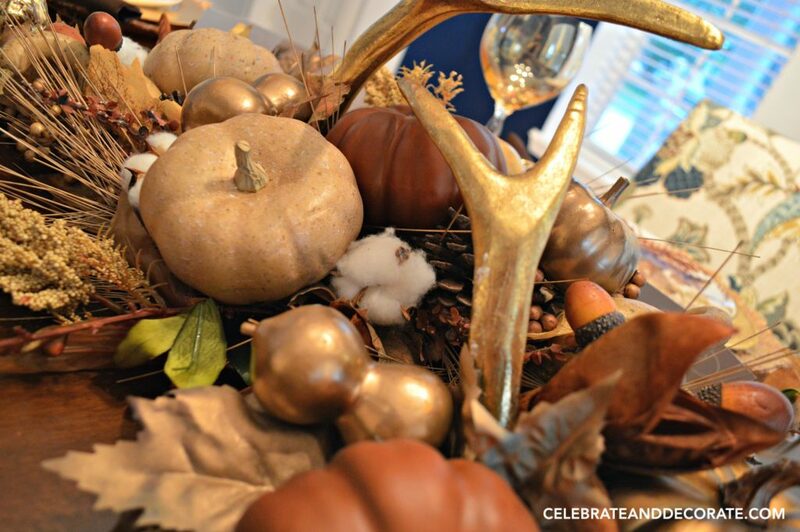 So many great textures and elements in your centerpiece. Beautiful job. I think I like setting a table more than cooking too. lol Thanks so much for all of your hard work and time in putting this together for us. This is so much fun! Your centerpiece is gorgeous Chloe! 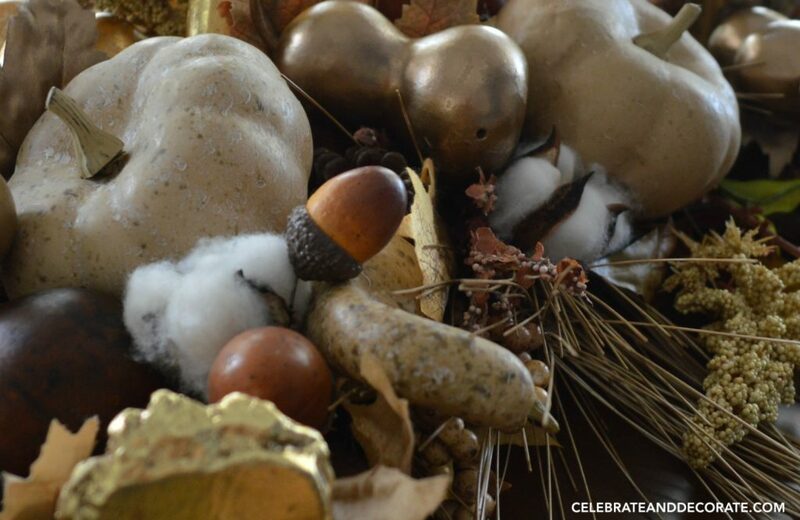 I love the way you tucked the cotton bolls in with your autumn mix and of course the gold antlers are stunning! And the placecards in the antler ornaments it such a clever touch-your plates and mats are beautiful, it’s so cohesive and well designed, just perfect!! Chloe, I knew you would have a lovely tablescape. I love the gold antlers. I’ve seen them quite a bit in stores this year, but didn’t know how to use them. They added a great metallic punch to your table. So warm and inviting. 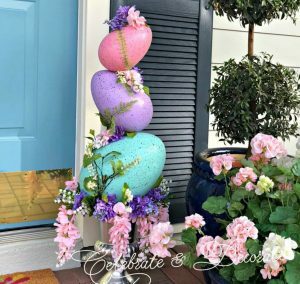 Thank you so much for hosting another awesome tablescape blog hop. Thank you Carol, when I saw those antlers at the AT Home store, I thought the gold would be perfect for my brown and gold table! You should have seen how many ways I tried them before I ended up with them like I did! This is so lavish and beautiful! It looks like a table you’d find at Pier 1 or Z Gallerie. The ambiance here is just awesome! Thank you Sandra! I was going for that catalog cover look, so I guess I was successful! 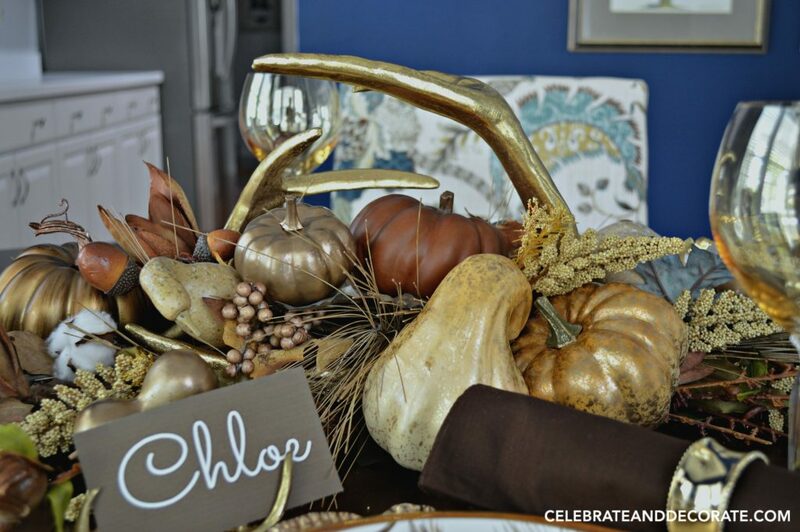 Chloe, this tablescape is absolutely stunning and evokes such a feeling of Fall! I love the color palette you chose of browns, creams, and golds. It looks so elegant! I adore those pheasant plates, and your beautiful centerpiece adding the perfect finishing touch to your beautiful table! Chloe, your table looks really sharp. Your arrangement in center worked out beautifully. The salad plates are terrific. 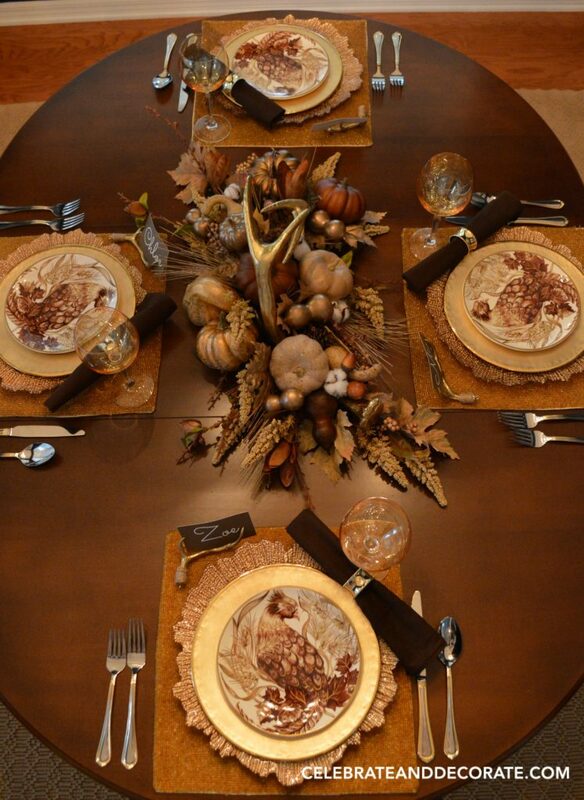 I really like table settings showing a nice wood tabletop, and especially for autumn. You can make magic with your tables, and this is another winner. So is the blog hop, I might add, with some really fine tables from all the participating bloggers so far…..and it’s just Tuesday! Many thanks. Chloe, your table is just lovely. The name cards are such an elegant touch and I love how you let the wood of your pretty table, take center stage. Thanks for the hop! I am inspired by all the creativity! Thanks you Kim, I rarely use place cards, but I wanted to showcase those little antlers! Another beautiful tablescape, Chloe! I love your plates, the antlers, centerpiece and your glassware. Gorgeous! First thank you once again for such a wonderful blog hop. It is truly a treasure of wonderful fall ideas. Your table is a classic and a timeless beauty. There is something to be said about the rich brown tones and various tones of gold and other metals. 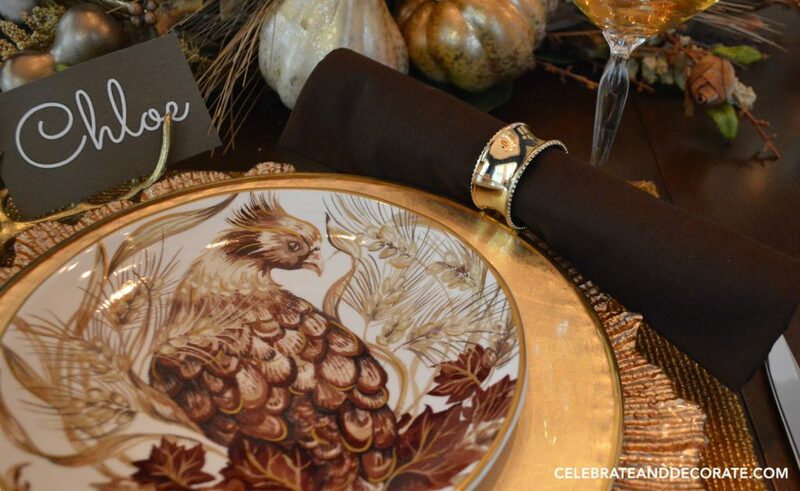 Your bird plates are so elegant and are further embellished by the gold antlers, leaves, acorns and gourds. Stunning! Your fall table is gorgeous! I love all the deep, rich colors with the glittery metallics- my favorite is that beautiful gold antler!! 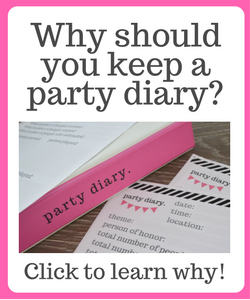 Thanks so much for sharing and organizing another fabulous blog hop!! Thank you so much Kristy! the antlers were just a last minute addition from At Home! How pretty Chloe. You know how to set a lovely table. 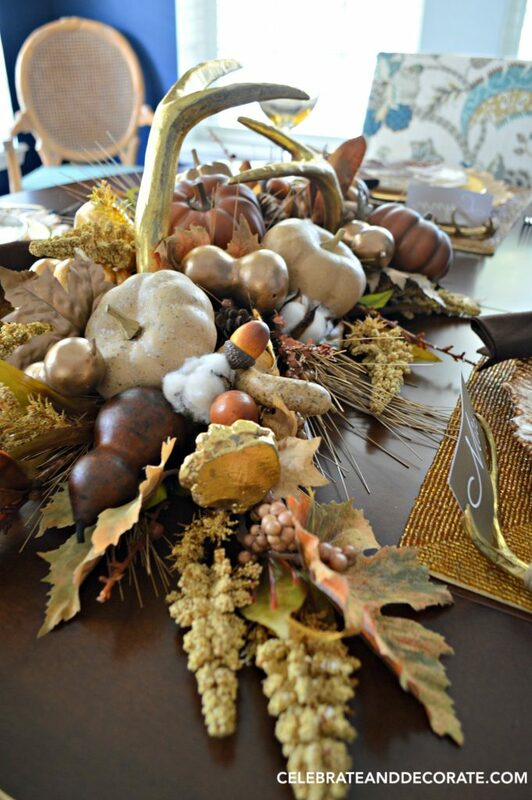 The centerpiece screams fall. Love the gold antlers. Rich browns and gold speak fall to me. I have always admired those beautiful chargers from Zgallerie. The bird plates are quite unique. This has been so much fun admiring these lovely tablescapes. Thanks again for hosting. Thanks so much for including me in this wonderful blog hop! Will be pinning today!! Thank you for your kind compliments Lory! 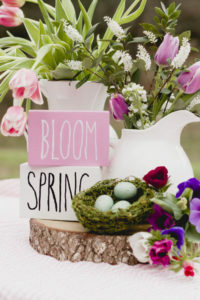 I am happy to have you as a part of our tablescape blog hop! Oh Chloe! 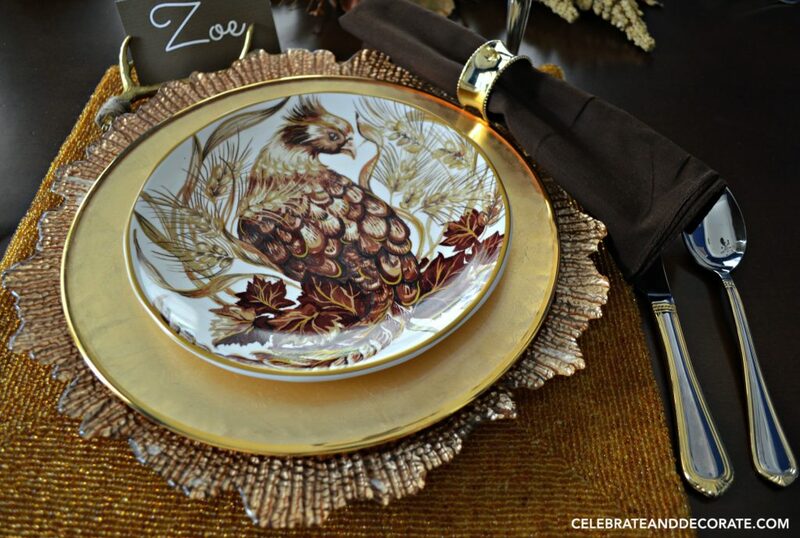 No wonder you are the hostess of this blog hop…you have set such a gorgeous fall tablescape! I especially love the colours you chose to use and how you worked your talents to bring out those tones in the dishware and centerpiece items. Fantastic antlers and you’ve displayed them in such a pleasing manner among the lovely leaves and pumpkins of your centerpiece. Definitely pinning for inspiration! 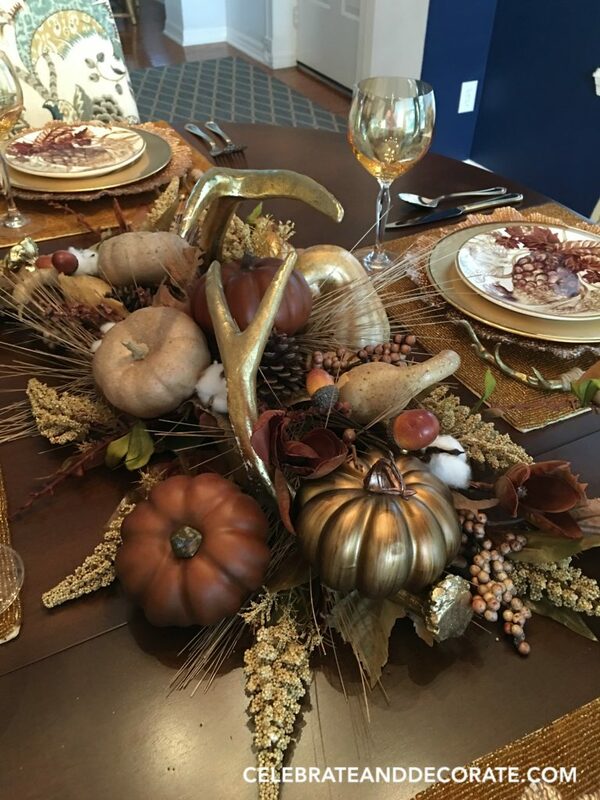 Chloe, your table is so warm with the browns and golds, the centerpiece is certainly the piece de resistance…all the elements that you used are stunning! Love the chargers and the plates! Just beautiful and I would love to sit at your table! 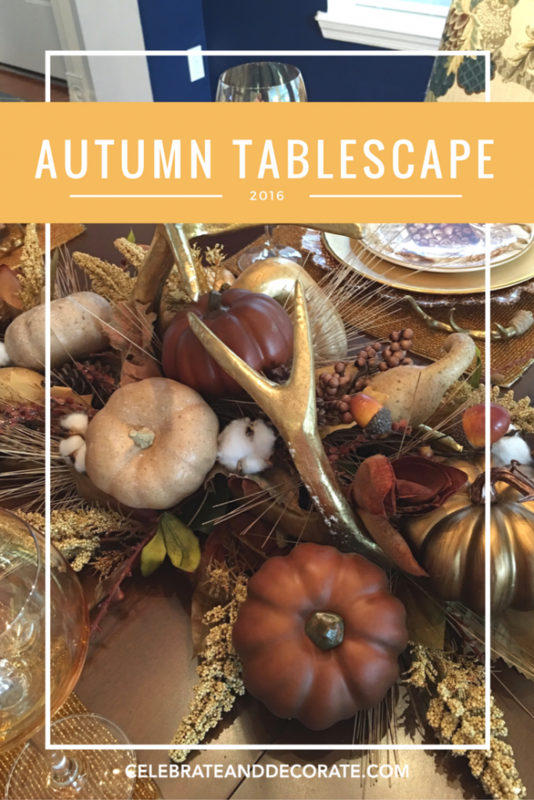 First of all, thank you for organizing this Autumn Fall Tablescape Blog Hop and for including me. I have enjoyed looking at all of the tables so far. The only thing that would be better is to dine at each of these tables with each blogger! Now for your beautiful table! I love your salad plates (are they pheasants, grouse?) They are so pretty framed with your gold plates. The rich fall colors are so warm and inviting. Great job! Thank you and you are welcome! I am glad you joined the blog hop. I have wondered the same thing about those plates, either pheasant hens or grouse. I have always used them in a more rustic table, it was fun to go with the gold! Stunning table Chloe, just stunning! Loving your dishes and chargers and you know I’d drool over those gold antlers. Just perfect, truly. A red carpet fall tablescape! Your table is so beautiful and elegant! It looks like it is straight out of a magazine! Thanks for sharing and for organizing such a fun bloghop! Thank you so much for your compliments. I appreciate you and all of the bloggers for joining the hop! Reminds me of the Hunter’s decor, I really love it. Love how unique it is and the colors and the trending antlers that truly play so well with the themed plates. Gorgeous. I too love the tables and decor for parties more than the food. I begin setting up the tables sometimes a week ahead if I can and have my stuff! Thank you so much Debbie. I am right there with you, let’s just set tables for imaginary dinner parties, right? Your centerpiece is gorgeous! The colors are so rich and deep and I love the metallic elements. Thanks so much for sharing and organizing and including me in such fabulous hop!! Thank you so much Kim! I love your Halloween table! How fun! What a pretty and unique centerpiece with those gold antlers! And those dinner plates. Stunning. The whole tablescape really as a “lodge” setting that reminds me of a peaceful, tranquil log cabin deep in the woods! Thank you so much Maureen. The gold antlers were a find! They were the last couple at my At Home Store…and to think, they are supposed to be Christmas decorations! Your table is so lush and rich! 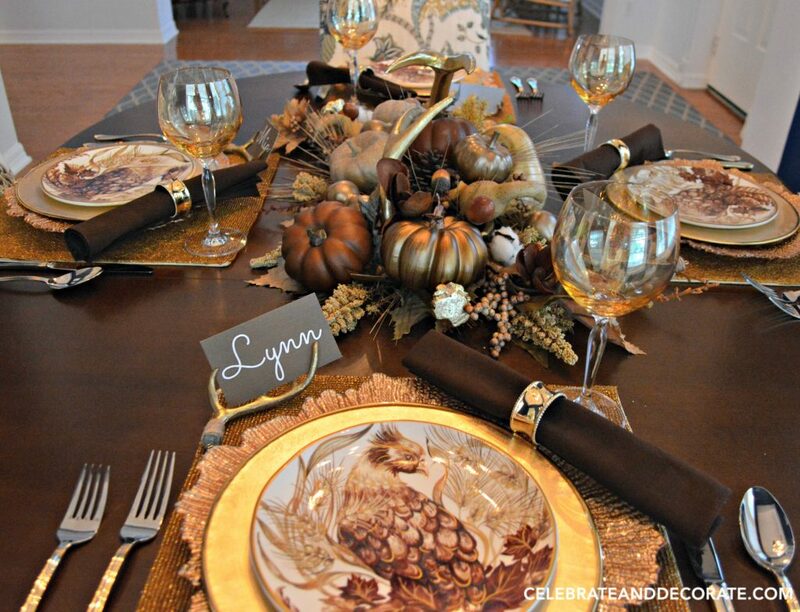 I love the centrepiece and the palette you chose reminds me of the autumn light: golden and shimmering. Thank you for organizing this hop. Thank you Sarah, and thank you for participating! Beautiful! I love the plates! And that centrepiece! To die for! Chloe, this is so pretty! I love the rich colors and the metallics that you used. Your setting is very lush and luxe. I love it! Thank you so much Shenita! What a stunning tablescape! I love those fall colors and those beautiful plates. Thank you so much for sharing with us at Dishing It & Digging It! I love the colors you chose! They are absolutely paired beautifully! What a beautiful table!!! I am new to your blog and am so glad I subscribed. The table is so warm and welcoming looking with your chosen colors – love the metallic touch and the cotton bolls and …. everything! I’m also like you, in that, I much prefer constructing a tablescape than spending time cooking! Thank you so much Elaine! I am glad you subscribed too! I hope you enjoy the rest of the Fall decor I will be showcasing in the next week! Tablescapes are one of my favorite things. I will be hosting a Holiday Tablescape Blog Hop featuring all kinds of bloggers’ tables the end of November! Beautifully done and I really love your dishes! 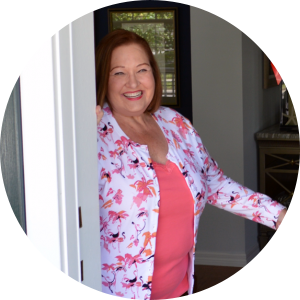 Thank you Cindy, for hosting! I just love your tablescape. Those plates are gorgeous! Thanks for sharing at Merry Monday. Pinning so I can come back and visit all the links! Gorgeous! Such deep rich colors. Your table is perfection! Thank you Valerie, I really wanted to avoid orange on the table this year.